Dr. Harold grew up in Detroit and graduated from Montieth College, Wayne State University with a bachelor of Philosophy degree (PhB). After graduating from the University of Michigan Medical school he did a rotating/surgery internship at Harbor General Hospital in Los Angeles (U.C.L.A.). Then after 2 years of general surgery residency at St Joseph Mercy Hospital in Ann Arbor, Michigan he completed the urology residency at the University of Michigan. He returned to U of M on a part time basis as a clinical instructor teaching residents in the operating room. Dr. David Harold is board certified in adult and pediatric urology and is licensed to practice in Michigan, Florida and California. 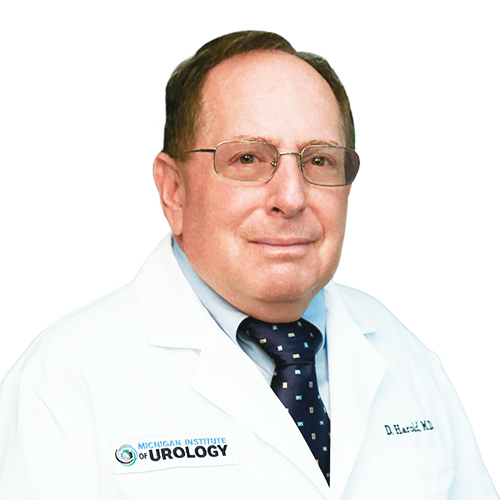 Dr. Harold’s practice includes the wide range of urology specialties that treat; kidney, ureter, bladder and urethral disease in men and women and of course prostate, scrotal and testicles in men. Dr. Harold was the chairman of the Division of Urology at St Joseph Mercy Oakland Hospital for 12 years until 2009. Since then he has been, and is currently the chairman of the Department of Surgery. Dr. David Harold sees patients at the Lexus building in Pontiac, 44200 Woodward Avenue, Suite 207 (across from St Joseph Mercy Oakland). He is also credentialed at the McLaren Oakland Hospital, William Beaumont Hospital, Royal Oak for lithotripsy (E.S.W.L.) and Henry Ford West Bloomfield.